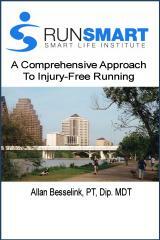 Mark April 1, 2008 on your calendars - as this is the day that I will release the first edition of the book "RunSmart - A Comprehensive Approach To Injury-Free Running". You will be able to purchase it directly from this website or by simply contacting Smart Sport International. Cost is yet to be determined. Keep checking in for updates as we get closer to the date of the first release!! Today I would like to announce the grand opening of the Smart Life Institute, a health initiative that provides sports science solutions for training, rehab, and life. August 13 will be a landmark day in the (R)evolution In Health. As a physical therapist for 19 years, I have watched the health care system and the perception of "health" in this country erode steadily. With 60% of the population being obese and chronic medical conditions on the rise, we need to make a serious effort at reform, not only in our health care system but how we view our personal role in health. Based on where we are now, this may be seen by many (clinicians and others) as a virtual Revolution. But - it has to start somewhere, somehow - and the Smart Life Institute is the foundation for this (R)evolution in Health. It's not just about a philosophy - it's about "doing health" in a different way. It's about personal power, about the accessibility of sports-science based research and it's application to our daily lives. It's about developing a synergy between client and clinician and establishing more effective solutions and improved outcomes. It's about competent self care and using learning strategies and information technology to foster personal transformation. But most of all - it's about YOU - and all of the "yous" in our global community. The Smart Life Institute will provide a philosophical and educational foundation for other entities. Smart Sport International will continue to be the model clinical practice of SLI, implementing it's philosophy and strategies for effective care. The Smart Physio network will bring together like-minded clinicians to collect outcomes data and produce reform on the clinical side of the equation. I would urge you to explore the Smart Life Manifesto - now available online under "About SSI". The Smart Life Institute website (www.smartlifeinstitute.com) will provide many new features for both education and consultation. Expect to see this "new look" site in the coming months. SSI - Now At South Congress Athletic Club! I am pleased to announce that Smart Sport International is now located at South Congress Athletic Club. The physical address is 1109-B South Congress Avenue - in the heart of the 78704 ZIP code in downtown Austin and less than a half mile from RunTex and the Town Lake trail! The South Congress Athletic Club is owned and operated by Marc and Tracy Frazier - and not only has a "no contracts" policy, but also no initiation fee! With this partnership, downtown Austin has a great resource for self-care, exercise, and health - all under one roof. For more information on South Congress Athletic Club, visit their website at www.socoathleticclub.com. The next RunSmart series will begin on January 7, 2008. The dates for the three session series are January 7 (Running Mechanics), January 21 (Strength-Plyometrics-Drills-Intervals), and February 4 (Recovery-Centered Training). Pre-registration via phone, web, or email is required. The RunSmart series has a rotating schedule much like a typical academic calendar. Register for the series - and take the sessions in order at any time during the year!! Program offerings are available on the "Calendar" link on this site. The Smart Life Institute has released it's fall and winter educational calendar. This has evolved out of SLI's mission to provide high quality and cost-effective education on a variety of current training and injury topics. The sessions will all be one hour in duration and cost $5 per person. Pre-registration is required. Please refer to the Calendar section for complete details and program listings. Chris Haycraft is making the trek from Houston to Tempe, Arizona for two challenges. The first challenge? His first Ironman. But along the way, he's got another challenge - to raise funds for the National Parkinson Foundation. It's a cause near and dear to him as Parkinson's Disease led to the untimely death of his father. On behalf of Chris, here is the link to donate to the NPF: http://www.parkinson.org/NETCOMMUNITY/Page.aspx?&pid=470&srcid=333&frsid=26.